Alberta Bound Clap and sing along as you get to know Canada’s tunes—everything from traditional fiddling to songs from beloved Canadian songwriters. Alfredo's Restaurant Performers Strolling musicians in the Italy showcase restaurant. Alpine Trio Traditional German polkas and waltzes in the courtyard. American Music Machine A vocal ensemble sings American pop with impressive a cappella riffs and an urban groove. Anacomical Players A real stress busting comedy show for the whole family inside Wonders of Life. The Aviators (stilt walkers) Three nomadic adventurers, traveling with an astronomer. Bella Fortuna A fusion of contemporary Techno and Italian Baroque music. Blåmann Folkloric Norwegian music influenced by other cultures and performed on violin, saxophone, bass and guitar. Blueberry Grass Band Listen to this expressive band from Québec performing French and English Canadian hits. Some of the band members were formerly Cirque Du Soleil artists—so get ready to be “wowed”! B'net Al Houwariyate Moroccan folk music with dance. Bodh'aktan Get into the Great White North with the creativity of Bodh'aktan—featuring Celtic, trad-Quebecois, punk, Irish folk, Breton and Maritime influences. The British Invasion 1960's British rock-n-roll revival. Bubble Nicolas Interactive performer of "tomorrow". Caledonia Bagpipes Heritage of the Scottish Provinces. Canadian Lumberjacks Axe throwing, chopping, sawing and lots more. YouTube video. Celebrate The Japanese Way Samurai on horseback, Martial Arts, Japanese folk dancing, storyteller, flute player, Minnie Mouse, and Japanese artisans. Two week run ended 9/1/03. Chalk Artists Students from Accademia di Brera, Milano. The Comic Watchguard Performed for a brief time in the UK showcase. Cyber Groove A techtronic band offering musical stylings from earth, space and beyond in Future World West. Dean Shostak Glass Armonica and other Americana instruments. 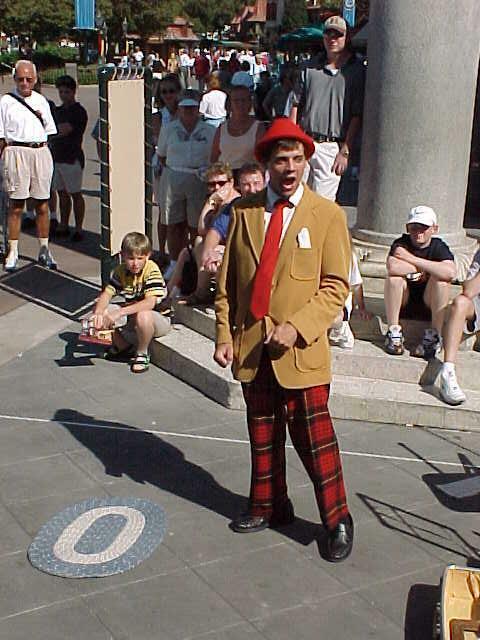 Performed in the American Adventure Rotunda from August 29 - September 3, 2001. DELTA Q Exciting a cappella quartet from Berlin. Disney Characters on Holiday The Disney characters are "on holiday!" Meet your favorite Disney stars when their sightseeing bus makes a scheduled stop. Disney's International Songbook Discover Mickey and his friends as they bring to life classic Disney tales from around the world! Dragon Legend Acrobats A variety of thrilling acts direct from China. DREAMFINDER Celebrate the imagination with the Dreamfinder and His Dragon Pal, Figment. Outside Honey, I Shrunk the Audience. 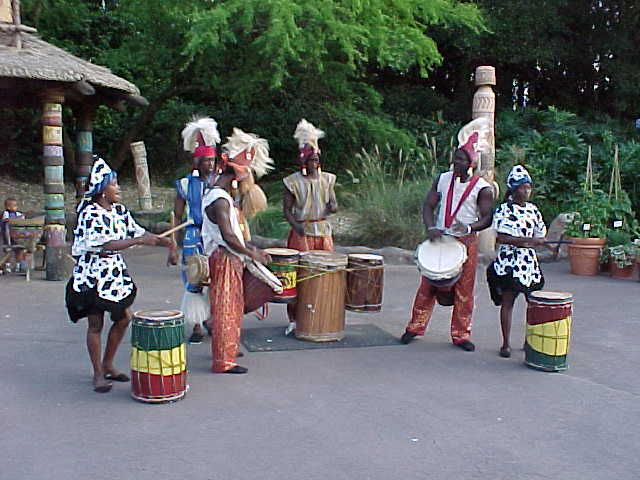 Drums of Congo African Rhythms and Dance. Durch & Durch Guitar pop from Kaarst, Germany. EpBOTS See the future of robotics come to life as interactive droids, Q-T-1 and DIGIT try out their new programming at Spaceship Earth. Epcot VYBE Celebrate the swing, jazz and gospel sounds of American music on the Future World Bridge. Festival Marrakesh The courtyard becomes a festival. "Finding Nemo" - Meet and Greet In front of Living Seas. Fiddler’s Joy Traditional Canadian folk music. Fossekallen Lively Norwegian folk music inside Puffins Roost. French Mime A comedic mime act. Future Corps Capturing the raw excitement and power of Drum & Bugle Corps and uniting it with the clarity of the contemporary big band. Groovin’ Alps Grab your lederhosen and get ready to dance along with this high-energy German percussion band. This group brings the sounds of the mountains to Epcot with Bavarian folk tunes played on items found on a dairy farm. The Hat Lady at the Rose and Crown Pub pianist and vivacious entertainer with international flair in the Rose & Crown. High Pockets Jazz ensemble playing Americana and Disney classics. Substitutes during Voices of Liberty rehearsals. The Houzali Troupe Amazing acrobats, and an incredible contortionist from Tangier and Marrakesh perform astounding feats. Huitzilin Explore the legends, customs, and traditions of Aztec-era Mexico through colorful song and dance. I Cantanapoli "Singers of Naples", portraying the beauty of classical and contemporary Italian music with impromptu guest participation. 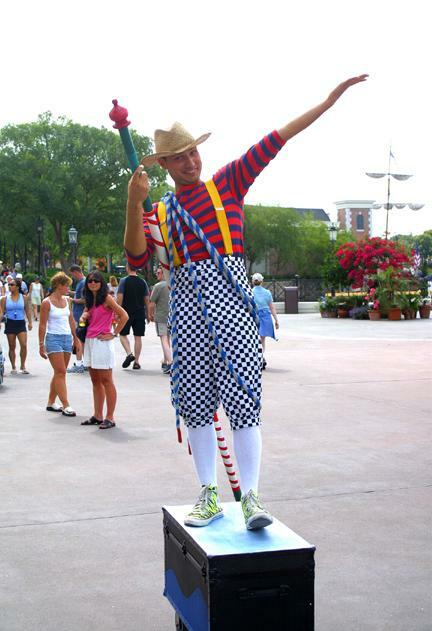 Imaginum: A Statue Act Living statues. Don't take them for 'granite', they're 'marblous'. Innoventions Discover tomorrow's technology today at this hands-on exposition of the world's newest products and inventions. Guests visit the house of the future, explore cyberspace, test the latest developments in computers and discover the latest breakthroughs in virtual reality and communications. The Japanese Way-A Walking Tour Of Japan Japanese storyteller. Jason Wethington - Pub Magician Performing in the Rose & Crown. Jon Armstrong Close-up illusion and fun, appearing and disappearing in the Rose & Crown. Junkanoo Bus Party with reggae, soca, and Latin music and dance from the Carribean Islands. Kristos Visiting aliens perform unearthly strength ballet at Innoventions Logo Plaza. Le Mime Roland: A Visual Comedy Act A comedic mime act in France. Leon Gregory Pub pianist in the Rose & Crown. Les Parfaits Inconnus(The Perfect Strangers) Circus, comedy, music and off-the-wall characters spring to life. Lochlann Lively Scottish/Celtic folk music. Los Carnales Traditional Mexican Tejano music inside the pavilion. Los Tres Amigos Mariachi Trio. Lou E. G. An Artist in mime and humor. Margret Almer & The Bavarian Band One of the most famous and popular show bands known for their highly successful shows and great music all over the world. El Mariachi Coco de Santa Cecilia Performing songs from Coco including the beautiful ‘Remember Me’ and the heartwarming ‘The World Es Mi Familia’ at the outdoor Mexico character greeting location through January 6, 2017. Marimba Mayalandia Four member marimba band performed in Mexico. May be found at Coronado Springs Resort. Marvaille De Guinea African dance troupe. Matboukha Groove Exciting Moroccan, Mediterranean & World Music fusion. Mission Space Character Greetings Mickey Mouse and Goofy in front of Mission Space. Miyuki Japanese candy artistry from Asakusa, Tokyo. MoRockin Arabic rhythms with a contemporary flair. Last shows September 27, 2014. Musique Aramenco Music of Morocco & belly dancer. Norway Vikings Keep a sharp eye out for wandering Vikings. Nova Era Classically inspired European music with a modern twist. Off Kilter High-energy progressive Celtic music. Last shows September 27, 2014. OrisiRisi Interactive drum circle and African folklore. Pam Brody Pub pianist and vivacious entertainer with international flair in the Rose & Crown. The Paul McKenna Band Contemporary Scottish Folk Music. The Pipes of Nova Scotia Enchanting music by a traditional Bagpiper. The Pipes of Scotland Traditional Bagpipes on the promenade or in the Rose and Crown. Polyjesters(formerly Fiddlestix) Band from Calgary filled in during Off Kilter's summer vacation. Quickstep Lively, acoustic musical repertoire from Scottish, English and Irish traditions. Raffy Rock out to the rhythms of this quartet whose infectious energy has swept across Canada and created ardent fans. Remy Experience Inside Les Chefs de France. Return 2 Zero Master vocalists and masters of disguise, Return 2 Zero are four powerhouse singers who have been surprising audiences for two decades with their undercover costumes and amazing harmonies. Ribab Fusion Smooth grooves to high-energy funk, fusing the traditional sound of the single-stringed ribab with a contemporary, Afropop style. Robot Various locations throughout Future World. Rondó Masquerade From Venice, Italy, this contemporary string septet performs classically inspired European music. Sahara Beat Dance and sing to the rhythms of Morocco. Sbandieratori Di Sansepolcro Energetic choreographed flag throwing to live music. YouTube video. Sergio International interactive juggler (Italy). by Chinese musicians, inside the Temple of Heaven. The SpectacuLAB Learn about the amazing world of science through this funny and fascinating show that features interactive experiences! Spelmanns Gledje Lively Norwegian folk music. Spirit of America Fife & Drum Corps A resounding tribute to America’s fight for freedom. Last shows September 27, 2014. Suroît Enjoy this folk band’s musical storytelling. Hailing from Québec’s Magdalen Islands, Suroît is influenced by Cajun, Celtic, bluegrass and rock stylings. Tam Tams Join the colorful pageantry, rhythms, and authentic dances of West Africa. Tapestry of Dreams Epcot's magical parade, "Tapestry of Dreams," celebrates children, dreams and the legacy of Walt Disney. The spectacle begins with Dream Seekers dancing alongside the Dream Catcher -- an enormous "float" that interacts with guests. The parade is a "visible dream," in which ideas, images and emotions are evoked through a series of extraordinary puppets and music. Test Track Allstars Travel-themed A Cappella group. Near the Test Track pavilion. Tapestry of Nations The "Tapestry of Nations" street festival at Epcot has been transformed into "Tapestry of Dreams," a parade celebrating children, dreams and the legacy of Walt Disney. TradNation Presenting the instrumental, song and dance traditions from the rich cultural heritage of French Quebec. Tzigantzi Join a traveling band of gypsies in a musical celebration of European-Slavic culture that will unlock the passions of the soul. Viva Mexico Traditional music, songs and dances from different regions of Mexico. What's Your Problem? Interactive comedy game show in Innoventions West. Wies N Buam The True Tradition Of Bavarian Folk Music. The Wonders of Laugh Interactive comedy show for the entire family in Wonders of Life. World Class Brass Comic Musicians on the move. World Showcase Players Live comedy show with audience guest stars. Last shows September 25, 2014. The Ziti Sisters Live comedy show with audience guest stars.